That was his situation just over four years ago, while living and working as a tractor-truck driver in Tampa, Florida. But in 2013 he, along with his partner Carolyn Willhoite, moved to the small town of Cotacachi, in Ecuador’s northern Andes. And it didn’t take long for his health to improve. 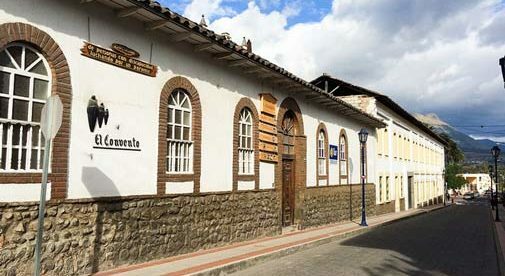 While Warren is certainly living a healthier life, there are many other things about small-town life in Ecuador that the couple enjoy, such as growing their own food. “In some areas of the States, you’re not allowed to even put up a small garden in your front yard,” says Carolyn. In contrast, here in Cotacachi they have a yard full of fruit-bearing trees like avocado, lemon, fig, peach, and apple. The extra time and low cost of living in Ecuador have given the couple the chance to travel, too. They recently returned from several days in Cuba and are planning a two-week tour of China this fall. Luckily they have plenty of time to do so, because they’ve found that taking it easy can be time-consuming in the best kind of way. “A 15-minute walk into town will actually take three hours, because you run into people and spend time chit-chatting,” says Carolyn. “Honey, I think we need to make a trip to the ‘Tad,” my wife Rita said to me the other day. “Great,” I replied. We’re just mad about the ‘Tad. The place my wife was referring to was La Libertad—a.k.a. The ‘Tad.